For a statement-making tropical addition to your garden or houseplant collection, look no further than elephant ear plants, which come in two common varieties. With their notably large and heart-shaped leaves, it’s no wonder why Alocasia plants are named after the lovable large animal’s ears. Colocasia esculenta, also a tropical perennial plant, has a more leathery texture and tends to droop downwards in contrast to its sibling, Alocasia, which sports shiny leaves and points upwards. 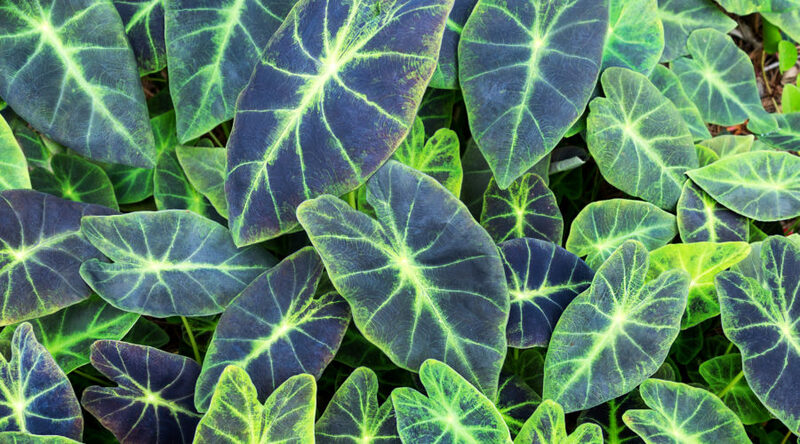 Whether you go Alocasia or Colocasia, the dramatic plants create a striking tropical effect in any landscape. These tropical Asian natives will grow as perennials in warm climates. Elephant ears prefer rich, moist soil and generally favor filtered sun but can be grown in full sun. Place the tubers directly outdoors 2-4 feet apart, 4-6 inches deep in rich soil. Most elephant ears grow to be 4 feet wide, so give them room! Water Alocasia below, at the root zone, and in the morning so they can go into the night dry. Alocasia sanderiana, African mask. Grows to 6 feet tall and wide. This elephant ear has arrow-shaped, deeply lobed leaves that grow 12-16 in. and has a metallic dark purplish, green hue with silver veining on the surface. The potting mixture for this plant must be well aerated and well drained, yet remain moist. Thriving in a moist environment, African mask will need plenty of water and filtered light. Alocasia cucullata, Chinese taro or Chinese ape. This type of elephant ear is a slow-growing, clumping evergreen plant reaching up to 2 ft. high and makes for an excellent indoor container plant. Preferring shade, rich soils, and plenty of water, it sports shiny, deep green, pointed leaves. Colocasia, ‘Illitrus’. Known for its charcoal black foliage and striking emerald green veins. Be sure to choose a fairly large pot when growing this type of elephant ear indoors due to its ability to attain to massive sizes. It requires indirect sunlight and high, humid temperatures. To increase the level of humidity, it should be elevated slightly with a layer of rocks or pebbles between the pot and the saucer.